Whether you’re considering a complete kitchen renovation or refacing your current kitchen cabinets, updating your countertops is one of the easiest and quickest ways to create a fresh modern space. However, it doesn’t take long during the early stages of a kitchen makeover to realize that there’s a wide variety of solid surfaces to choose from, and the sheer number of choices can make it difficult to determine the right type of counter for your home. Other price factors to consider include customizations and labor—both of which can vary from home to home and from contractor to contractor. Granite surfaces are within the budgets of most homeowners – even when they’re looking to save money on their kitchens. Granite offers an excellent ROI because it’s so durable and lasts. It’s also highly resistant to scratches and heat damage, making it the perfect surface for a busy family. As budgets increase, so too do the choices of solid surfaces. At this price point, homeowners may choose higher-end granite options or more creative cuts and edging. They also may consider certain types of quartz surfaces, which can be more consistent in appearance and available in a wider array of colors due to the added pigments. At the top level of kitchen design and renovation are even more options than at the moderate level. In addition to granite and quartz surfaces, many homeowners with large budgets choose marble or quartzite for their countertops. Marble – including Carrara, Calacatta, and Statuary Italian marble—has larger patterns with more consistent veins of color than granite, while quartzite – such as Victoria Falls or Fusion – is harder than both granite and quartz. 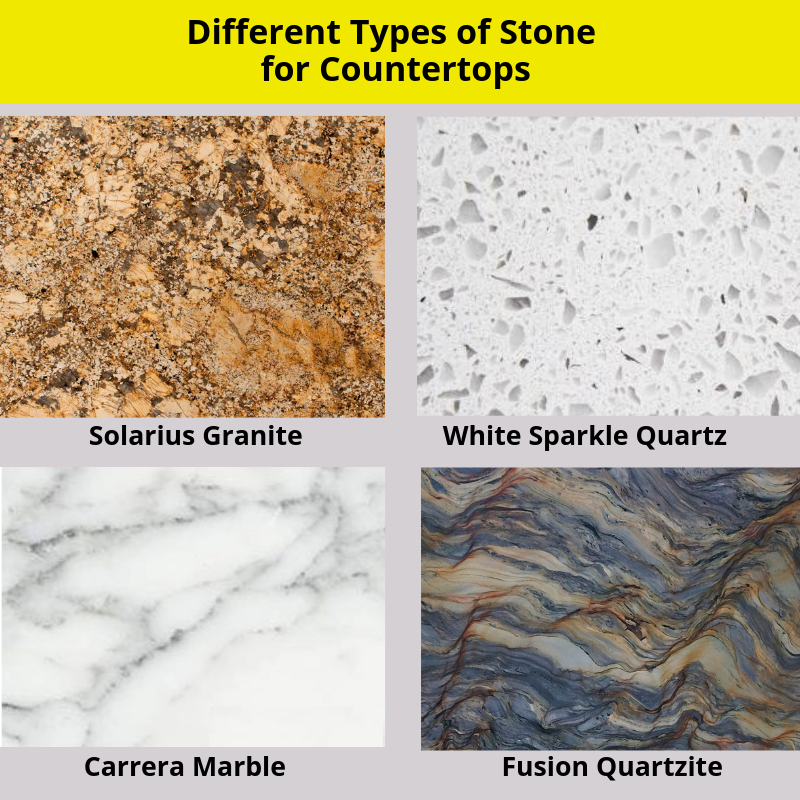 Ideal for both thin and thick granite slab countertops, round edge and double round edge produce clean-lined designs and rounded corners that prevent damage and injuries. 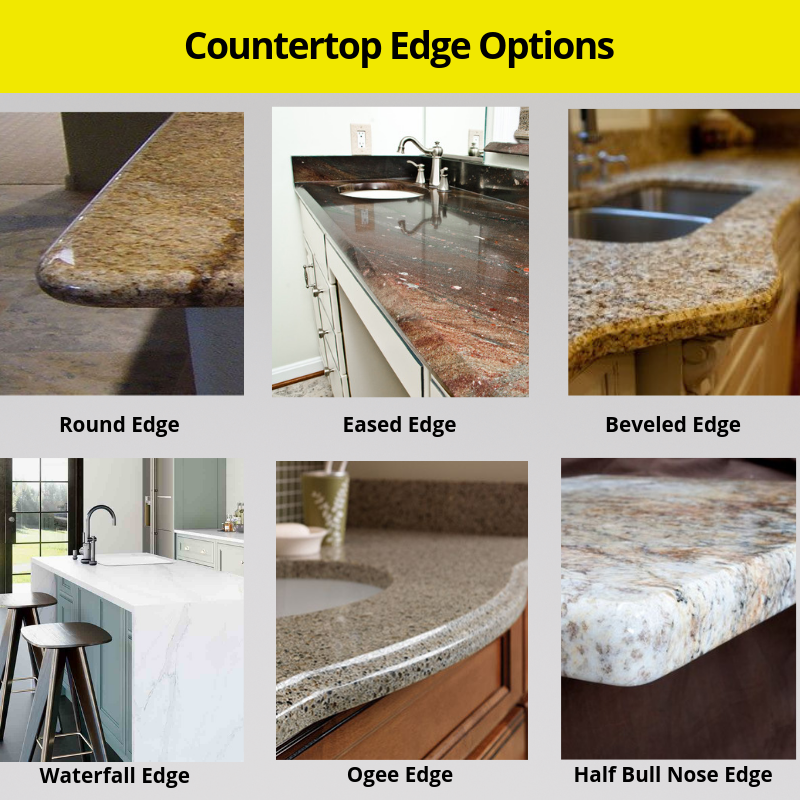 The most commonly used edging option for granite countertops, eased edge surfaces have soft edges and thick profiles that create a dramatic look and feel. Marked by clipped flat corners typically at 45-degree angles, beveled edge and double bevel countertops are also popular for more traditional designs or when you’re looking for a subtle flair. Bullnose edge options add a curvature to solid surfaces. Half bullnose edges enhance the thickness of countertops, while full bullnose and demi bullnose edges make countertops thinner and sleeker. Perfect for traditional kitchens, ogee edges are marked by a characteristic “S” shape, which can vary from deep to shallow depending on the materials used and the homeowner’s preference. Perhaps one of today’s hottest design trends, waterfall edging extends the stone all the way down the side of the cabinet base. This look is a popular countertop edge for kitchen islands and open concept designs. At Factory Direct, we know that beginning a kitchen renovation can create more questions than answers. With so many choices available—each with their own budgets and strengths—it can be difficult to decide what’s right for your home and your family. Factory Direct Renovations Group offers expert kitchen design, project management and contractor services all working together to bring you a seamless, cost-effective solution that fits YOUR lifestyle and budget. Contact us today and set up your appointment with Lead Designer Bruce Imhoff, who can help you pinpoint the design elements that are right for you. For countertop installation in Palm Beach, Broward or Miami-Dade – or any other home remodeling needs – contact us today.